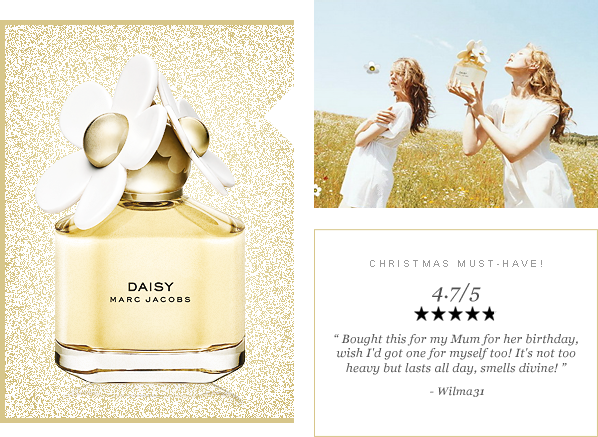 Emma, Escentual Beauty Editor: I remember the very first time I smelled Marc Jacobs Daisy. It was 2007, and I was a bright eyed sales assistant working on a busy fragrance counter. At that time the stratospheric rise of the celebuscent was well under way, and big-hitting prestige fragrances dominated the store. There were few scents that successfully bridged that gap between luxury and fun, and that’s why I can remember the buzz around Daisy’s launch so vividly – it was in a league all of its own. The Daisy fragrance is very easy to wear. Its signature is a frivolous blend of strawberry and violet, lifted with the subtle sharpness of grapefruit. In the heart, a bouquet of jasmine and Marc Jacobs’ favourite flower gardenia lend creamy tones, which are supported by the comforting warmth of vanilla, musk and woods in the dry down. The overall effect of Daisy is light-hearted and fancy-free, and it’s one of those rare fragrances that is actually quite timeless and cross-generational. As for that now-iconic bottle, well – who ever thought a plastic daisy-topped bottle would ever become a classic? It certainly is though. The opulence of the heavy glass bottle, its refined golden facets and its delicate golden juice are balanced with the whimsy of the petalled stopper that is both desirable and tongue-in-cheek. As you can probably tell, I adore Daisy – and I’m sure you will too. Amberlikescats, Customer: This is one of the first fragrances I’ve ever purchased and it is one of my favourites. It’s a beautifully light scent that just gets floral done right. Generally speaking, I’m not fond of heavy florals, but ‘Daisy’ is light and has a hint of sweetness that is lovely. This would be a great scent for anyone who wants something for everyday or is just starting out wearing perfume. The longevity on this isn’t the most amazing, but I find that it lasts a good portion of the day on my skin. I would wholeheartedly recommend this! Wilma31, Customer: Bought this for my Mum for her birthday, wish I’d got one for myself too! It’s not too heavy but lasts all day, smells divine! Little Debs, Customer: Such a lovely fragrance one of my favourites. Lots of people comment on the scent when I wear it. Can be worn both day and night time as not a strong scent. I love it! Babe1, Customer: A beautiful light fresh fragrance, perfect for day or evening and for any age and a lovely bottle to display on my dressing table, I just love Marc Jacobs Daisy!! This entry was posted on Monday, December 16th, 2013 at 10:00 am and is filed under Fragrance. You can follow any responses to this entry through the RSS 2.0 feed. You can skip to the end and leave a response. Pinging is currently not allowed.